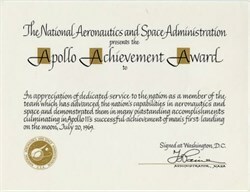 Beautifully printed unissued Apollo Achievement Award Certificate from the National Aeronautics and Spce Administration issued in 1969 commemorating Apollo 11's successful achievement of man's first landing on the moon on July 20, 1969. 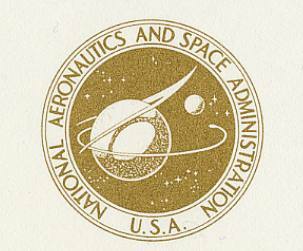 This historic document has a vignette of NASA company seal. This item is hand signed by the Company's Administrator and is over 35 years old. Dr. Thomas O. Paine was appointed Deputy Administrator of NASA on January 31, 1968. Upon the retirement of James E. Webb on October 8, 1968, he was named Acting Administrator of NASA. He was nominated as NASA's third Administrator on March 5, 1969, and confirmed by the Senate on March 20, 1969. During his leadership the first seven Apollo manned missions were flown, in which 20 astronauts orbited the earth, 14 traveled to the Moon and four walked upon its surface. Many automated scientific and applications spacecraft were also flown in U.S. and cooperative international programs. Paine resigned from NASA September 15, 1970, to return to the General Electric Co. in New York City as Vice President and Group Executive, Power Generation Group, where he remained until 1976. Paine began his career as a research associate at Stanford University from 1947 to 1949, where he made basic studies of high-temperature alloys and liquid metals in support of naval nuclear reactor programs. He joined the General Electric Research Laboratory in Schenectady, New York, in 1949 as research associate, where he initiated research programs on magnetic and composite materials. In 1951, he transferred to the Meter and Instrument Department, Lynn, Massachusetts, as manager of materials development, and later as laboratory manager. Under Paine's management the laboratory received the 1956 Award for Outstanding Contribution to Industrial Science from the American Association for Advancement of Science for its work in fine-particle magnet development. From 1958 to 1962, Paine was research associate and manager of Engineering Applications at GE's Research and Development Center in Schenectady. From 1963 to 1968 he was manager of TEMPO, GE's Center for Advanced Studies in Santa Barbara, California. Paine's professional activities have included chairmanship of the 1962 Engineering Research Foundation--Engineers Joint Council Conference on Science and Technology for Less Developed Nations; secretary and editor of the E.J.C. Committee on the Nation's Engineering Research Needs 1965-1985; member, Advisory Committee and local chairman, Joint American Physical Society--Institute of Electrical and Electronics Engineers International Conference on Magnetism and Magnetic Materials; chairman, Special Task Force for U.S. Department of Housing and Urban Development; Advisory Board, AIME "Journal of Metals"; member, Basic Science Committee of IEEE, Research Committee of the Stanford University School of Engineering, and Board of Scientific Advisors of the Quarterly Journal "Research Policy." Paine was born in Berkeley, California, November 9, 1921, son of Commodore and Mrs. George T. Paine, USN (Ret.). He attended public schools in various cities and was graduated from Brown University in 1942 with an A.B. degree in engineering. From 1946-49 Paine attended Stanford University, receiving an M.S. degree in 1947 and Ph.D. in physical metallurgy. He has received honorary doctor of science degrees from Brown University, Clarkson College of Technology, Nebraska Wesleyan University, the University of New Brunswick (Canada), Oklahoma City University, and an honorary doctor of engineering degree from Worcester Polytechnic Institute. In World War II he served as a submarine officer in the Pacific and in the Japanese occupation. He qualified in submarines and as a Navy deep-sea diver and was awarded the Commendation Medal and Submarine Combat Insignia with stars. In 1985 the White House chose Thomas Paine as chair of a National Commission on Space to prepare a report on the future of space exploration. Since leaving NASA fifteen years earlier, Paine had been a tireless spokesman for an expansive view of what should be done in space. The Paine Commission took most of a year to prepare its report, largely because it solicited public input in hearings throughout the United States. The Commission report, Pioneering the Space Frontier, was published in a lavishly illustrated, glossy format in May 1986. It espoused "a pioneering mission for 21st-century America"--"to lead the exploration and development of the space frontier, advancing science, technology, and enterprise, and building institutions and systems that make accessible vast new resources and support human settlements beyond Earth orbit, from the highlands of the Moon to the plains of Mars." The report also contained a "Declaration for Space" that included a rationale for exploring and settling the solar system and outlined a long-range space program for the United States.